Last night, I posted a semi-defense of certain controversial comments made in the wake of Robin Williams’ suicide and a general suggestion of how Matt Walsh, Rush Limbaugh, Bryan Kemper and others might have done better. He anticipates this response a few paragraphs above, but that is precisely the problem. Mental health issues, addiction, etc., reduce or remove culpability. Now, the mentally ill person may remain culpable for what is done while sane, but the question–which none of us can answer in this life–is whether the person who commits suicide truly has control of his or her will. People like causes. They like to have someone or something to blame, especially if it isn’t themselves. “He was depressed because his career was in the tank” is an easy target versus “He was depressed because he had a genetic condition that made it difficult to control his emotions.” That gets into a mess of problems about free will versus determinism. Then there’s the controversial, “He was post-abortive,” which I want to discuss in a separate post, but while guilt, financial troubles, or frightening medical diagnoses may contribute to mental health issues, we cannot deny that there are physiological components. Matt Walsh is right that there are spiritual components, but wrong to dismiss “chemical imbalances” as modernist mumbo jumbo. Physiological understandings of depressive disorders are nothing new at all. The Branagh/Branagh (1996) version depicts Hamlet as almost sociopathic (choleric), with the melancholy a complete facade. The Almereyda/Hawke (2000) version depicts Hamlet as straight-up clinically depressed. Either way, all effective writers are natural psychologists and write their characters so well that they can be readily diagnosed (always baffles me that people insist you can’t “diagnose” fictional characters because a particular health problem or mental health issue wasn’t named: people still had problems). Shakespeare drew from the psychology of his day and also left the character open to interpretation because he was aware of the debates that existed even then. One of the concerns Walsh, and many others raise in critiquing a biological interpretation of mental health, is the spiritual component. Fr. John Corapi would compare it to any physical disease: you might have a genetic predisposition to something. Then you add in the component of an actual physical trauma, poor nutrition, etc. Then bacteria come into the wound and infect it. With mental health, you may have a genetic predisposition to bi-polar, depression, schizophrenia, autism spectrum, etc. You experience traumas that other experience but they hurt you more because of your predispositions. Things that might cause a brief situational depression for anybody are devastating (or, conversely, one thrives in a crisis). Then the demons, like bacteria in a wound, come along and whisper “You’re unworthy.” They infect the emotional wound and refuse to leave. That certainly needs to be dealt with, and most treatment programs acknowledge it. If Robin Williams had shot himself, certain people would be calling for restricting the ability of mentally ill people to own guns. They cite statistics on gun deaths in America, more than half of which are suicides. It is noteworthy that these same people objected to “politicization” of his death when some pro-lifers pointed to his status as a post-abortive father (post-abortion syndrome contributing to many suicides), or when Rush Limbaugh, ironically or inadvertently “politicized” his death by complaining about the media politicizing it. Yet the same people would have readily “politicized” it if it had been a gun suicide. That’s another easy cause, though, that people look for. They try to say, “It’s guns,” except when it’s not guns. Nobody is talking about legal action to restrict ownership of ropes, or belts, or plastic bags, or knives or razors by mentally ill people. The real issue there is why people must rely on the government for everything. A desperate person will find a means. One last observation under this topic is the question of medication. Some people will say, “See? This proves meds don’t work!” or “This proves meds make things worse!” One of the reasons it’s important to nail down the right diagnosis is that the wrong medicine really can be disastrous. Someone with bipolar needs to be on bipolar meds, not necessarily anti-depressants or anti-anxiety meds, which can cause a horrible mania and, in turn, drastic behavior. Accurate diagnosis is so very important, as are accurate treatment methods. Plus, I have never been comfortable with getting emotional over celebrities, whether living or dead. I pray for them, either way, and leave it at that. Somehow, even before I knew the details, however, the death of Robin Williams kind of hit me, and when the details came out, it hit even closer to home. The subsequent media frenzy has touched on a number of issues that I have been wanting to write about, anyway. Some people have been condemned, rightly or wrongly, for calling for caution in how the issue is being handled, especially given the circumstances, and I’d like to address those two main areas of concern *in general*. Again, there is generally a reaction in these situations to the true neo-Pelagianism of “he was a ‘good man. '” As the cartoon that accompanies Fr. Rutler’s piece reminds us, Our Lord, and Bl. Teresa of Calcutta (whose death was one of the events that inspired it) have both cautioned “No one is good but God.” “Judge not” works both ways. Salvation is not a game of mathematics, where good deeds win points and bad deeds take them away. Nor is it a magic formula of sacramental grace or saying, “I accept Jesus as my Lord and Savior” being a “Get out of Hell free card.” Salvation is about relationship, and again I’ll address that later, perhaps. Right now, I wanted to focus on what I think is the problem when dealing with death from a pastoral theology standpoint, and the major worry regarding suicide. While they may or may not have phrased it badly, and often the harshest critics have been those who’ve faced this temptation itself, one of the biggest problems some people are having is language like the now-infamous, “Genie, you’re free” meme, or saying things like, “He’s in a better place.” These words may seem consoling, but they can, as Rush Limbaugh, Matt Walsh, Todd Bridges and others have attempted to warn, be severely tempting to someone in the grip of despair. If such language is problematic with a natural death, it’s dangerous in this case. When I was seven years old, and first became aware of how different I was from other children, I first thought about jumping out a window because I’d heard about reincarnation on TV and thought I could come back with a better body. “I didn’t break any mirrors. Why have I had seven years of bad luck?” I cried on my birthday. What saved me then was my parents telling me there was no such thing, and that if I did that, I would go to Hell. Just last year, when I was on a respirator and feeding tube, and sedated, and hearing the ICU nurses debating questions of Obamacare regulations, organ donation, and “why don’t they just pull the plug,” and for a time (time at that point was irrelevant, but that’s another story), I became convinced that everything I believed as a Catholic was wrong, and that it would be better to pull the plug. Thankfully, they didn’t take the new “living will” I attempted to draft seriously. They *did* take it seriously in assigning my a psychiatrist, but again that’s another story. I just bring it up here to say that, attempts to console one person might bring another to despair. That brings me to my other main thought. These “insta-canonizations,” as they’re referred to, whether of celebrities or the fellow down the road, are often well-meaning attempts to practice two of the corporal and spiritual works of mercy at the expense of others. It is a corporate work of mercy to bury the dead. It is a spiritual work to comfort the sorrowful. However, in comforting the sorrowful, we must be cautious not to use language that discourages praying for the dead. Purgatory is temporary, and the holy souls in Purgatory know they’re going to see Jesus, but that no one imperfect can stand in the presence of God. They can intercede for us, but not for themselves. However, they still suffer, and our prayers and sacrifices on their behalf can alleviate their suffering if not free them, so well meaning attempts to say that someone “is in a better place” and presume that he or she went straight to Heaven is failing in one of the spiritual works and discouraging others from practicing it. The traditional Requiem prayers are all about the awesome judgement of God, and in addition to praying for the deceased, reminding those in mourning that we, too, are mortal. That’s where admonishing sinners, instructing the ignorant, and counseling the doubtful come into play. We’ve covered 5 of the 7 spiritual works of mercy, and the other two provide the last guidepost in these situations: bearing wrongs patiently and forgiving willingly. Whatever wrongs a deceased person has done must be forgiven by us if we are to show mercy. We must always forgive as we would be forgiven, so even if the person hasn’t asked God’s forgiveness that we know of, and while we must not commit the sin of presumption ourselves, we may and should offer forgiveness to the dead–though, again, forgiveness requires acknowledging something to forgive. We can talk about a person’s good qualities and the signs of hope while acknowledging the things that need forgiveness. Thus, when we look at the various arguments surrounding the Williams suicide, there have sadly been many offenses against Mercy, but we should forgive each other. God Comes to Us in the Soft Voice: O Me Of Little Faith! People like to say, “Jesus will understand.” They talk of their “nice guy,” thumbs of Jesus but then come readings like this week’s. The Apostles are cowering in a boat in a storm. They’re *fishermen* and they’re scared. They see Jesus and think He’s a ghost (when I was a kid, I assumed this was a post-resurrection story). Of all of these twelve chosen men, who have already come back from their first commission and worked miracles on the Lord’s behalf, one has the courage and love to jump out of the boat and run to Jesus. Then he wavers. And what does Our Lord say? If *that* is “little faith,” imagine what we all should be capable of. If St. Dominic Savio told his former teacher, St. John Bosco, in a dream that he could have saved many more boys if he’d had more faith, what does that say of us? When I had my aortic repair surgery in March 2013, I lost my left vocal cord. The laryngeal nerve was paralyzed: they don’t know whether it was cut or pinched off. After 3 months in the hospital and multiple follow-up surgeries, I had an injection to try and restore some of my speech. The injection was basically Botox, and the goal was to swell the left vocal cord so instead of being permanently open, it was permanently closed. That helped restore my ability to speak enough that I could make a phone call and carry on a conversation. It was a temporary injection supposed to last a couple months at least but only lasted a little over a month. I didn’t like the side effects, and the surgeon told me the only option was likely to be “reenervation,” when they somehow do a nerve bypass. After doing some research, I decided I didn’t feel comfortable with that path and its risks. I also figured that if Julie Andrews doesn’t have enough money to get the right procedures to get her singing voice back, I might as well pray and wait for a miracle. A few weeks ago, we were in Virginia visiting my wife’s family and met a couple Facebook friends in person. This one lady (keeping her anonymous so she doesn’t get bombarded) brought along a rosary from the Holy Land. She’s a traditionalist, so I was a bit more open to her claim than I might have been rom a charismatic. She said that the first time she prayed it, her dog was healed of pancreatic cancer. Another time, she touched a lady at church with it, accidentally, and the lady was cured of cancer. I was wavering between doubt and hope, skepticism and faith. People describe a feeling of warmth with a healing. As I was arguing in my head about whether God would be willing to give me such a wondrous miracle, I felt that sensation, and a bit of a buzz. The evening we were driving back to South Carolina, he called and asked how we were doing, whether we were home yet, etc. We actually had a conversation! I called my sister and one of my brothers that weekend. I have managed to handle several phone calls in the subsequent weeks that my wife would have had to handle for me. Then Father started his homily and addressed the first reading. “God comes to us in the soft whisper,” he said. God has come to me in the soft whisper. It pains me (literally) to be unable to sing today. Our organist played the Holy Holy and Amen I grew up with. She played “All Creatures of Our God and King” for the recessional. I tried to sing. I managed a bit, but it was painful. Might I be able to sing now if I’d had a bit more faith in that moment of healing? Or did God give me just what I needed, my daily bread, though He still wants me to learn from my “soft voice”? Lord, I believe! Help my unbelief! Will the real Fatima.please stand up? 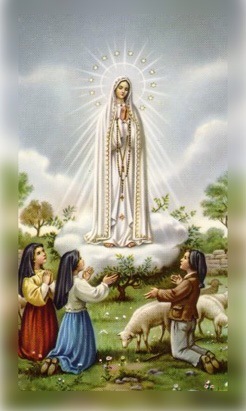 It dawned on that, everywhere I look, I see people who need Fatima’s message, yet even most who “promote” it get it wrong. For many, Fatima is “about Vatican II,” when, if anything, Vatican II was about Fatima. For many, it was and is about a magical formula for the “consecration of Russia” that will lead to the magical “conversion of Russia,” and in turn to an “era of Peace.” Those prophecies are open to interpretation until they can be seen through the lens of history. Sr. Lucia said St. John Paul fulfilled it. If he didn’t, it’s too late, anyway. Russia’s errors have spread through the world: not just the Communism that is encroaching on the US thanks to so many money-hungry “Catholics” voting for Obama, but also abortion (the USSR was the first country to legalize it). Wearing the Scapular or Miraculous Medal. How many people do these practices at all, much less with the depth and sincerity Our Lady called for. Francisco didn’t see her the first few times. He was below the age of reason and yet she still said he was guilty of too many sins and needed to say many Rosaries to see her and to avoid Purgatory. Yet we presume we’ll all be instant Saints. She showed them souls falling into Hell like snowflakes, yet we hold to a watered-down universalism. She said souls go to Hell mostly for sins of the flesh, which are as disgusting to the Devil as they are to God, and that, “Fashions will be introduced that will offend my Son greatly.” Yet we fall right into the filth with the rest of the Culture of Death. I’ve been praying the Office since 1997 or ’98. My aunt and uncle sent me a copy of _Christian Prayer_ for, I believe, my Confirmation. My wife also had a copy she’d received from an uncle. We bought the four volume set (at least two of one). The latter is tricky because despite my best efforts, I always seem to be unable to find the correct volume for the season. The one volume versions have both fallen apart from use. One of the goals of Vatican II was to make the Liturgy of the Hours more accessible to laity, reducing its complexity, but many people are still intimidated by all the “ribbons,” keeping track of the Psalter, the Proper of Seasons, the Proper of Saints, and the various Commons, etc. It was about 10 years ago that I started thinking how it should be relatively easy to create an interactive version of the Office using HTML, where one could click on a link, bringing up a frame with the appropriate materials, and providing choices for optional memorials, or memorials celebrated as personal Feasts, etc. So, I created several HTML files in Word, and made it part of my daily prayer to type the relevant sections into the appropriate files. Then I discovered that others were already deep into similar projects, and I saw little need to recreate their work, though some of the problems still remain, as I will discuss in reviewing and linking each site in this post. The Liturgy of the Hours is one of the oldest prayer forms in the Church, and is used by Catholics, the various Orthodox churches and many “mainline” Protestant denominations. In Roman Catholic (as opposed to Byzantine/Orthodox) theology, the Liturgy of the Hours is “public prayer” or liturgy, an extension of the Mass. To pray the Office is to pray “with the Church,” so it’s important the words be as unified as possible. This is distinguished from “private devotion.” So, in a popular internecine debate among faithful Catholics, 1,000 people saying the Rosary are in “private prayer,” while one person praying the Office under certain circumstances is engaging in “public prayer.” Catholic clergy (bishops, priests, deacons), religious (nuns, monks, friars, sisters) and members of secular orders are under canonical obligation to say the Office but also have the grace of praying “publicly” even when we’re “alone,” because in sharing the common texts that others are praying around the world, we are joining with them spiritually. For laity who are not in Third Orders, it’s still a private devotion, unless they’re saying it in community with others. Thus, the “trick” with online adaptations is whether the translations are appropriate. Even a few years ago, there were not as many options there are now. Perhaps the most popular and well-made, and the one I use most regularly, is DIvineOffice.org. It has all its copyrights in order and uses the canonically approved texts for the US. It also has very well-made podcasts of a group of people praying the Office, with licensed hymns, and the participants (mostly volunteers who, IIRC, started the project as a way of teaching the Office to an RCIA class) alternate methods of communal praying: sometimes chanting the Psalms, sometimes repeating the antiphons, sometimes having one person read or sometimes alternating. You can read the text with no audio, listen to the audio, or read and listen. The audio usually takes about 20-25 minutes for morning prayer and 15-20 minutes for evening prayer, depending upon how much is chanted. Before Divine Office, I used to use PrayStation Portable from Fr. Roderick Vonhogen’s SQPN. I used to also have it on an RSS feed here but found it was unreliable. Sometimes, it seems to update too quickly and you can’t find the actual links for the day. Other times, there was a delay in posting. I hope they’ve fixed those issues, but it’s been a while since I followed it. It’s just Fr. Roderick reading it, not a group of people, and much simpler, but he does include prayer requests that listeners send him as part of the General Intercessions. Plenty of websites and apps offer the Traditional Breviary, and several sites offer the various offices of Eastern Churches. The added challenge, which led to my most recent discovery of a treasure trove of sites, is praying “Optional Memorials,” days that are not on the “General Calendar” (such as the Discalced Carmelite Propers), days that are personal/community Feasts or Solemnities, etc. CatholicCulture.org* has a cool Liturgical Calendar page with the Feast(s) or Saint(s) of the day on both the Extraordinary Form and Ordinary Form Roman Calendars, Collects, devotional prayer suggestions and other activities. So, if I’m looking for a Collect that’s not in DivineOffice.org, I have been turning to CatholicCulture. Liturgy Archive is exactly what I imagined 10 years ago. It is a basic HTML page with links to every option for the entire year: the liturgical seasons, and the collect for every saint on the general calendar. It also has the Commons. So now, when it’s a Carmelite day, I go there for the Commons. I don’t know what their arrangements are with the copyright-enforcing USCCB, but it’s all there for now. Its wider “Archive” has both internal and external links for a variety of liturgical prayers from a number of Christian traditions. iBreviary is also very good. Indeed, when I heard people say “iBreviary,” I always thought they meant “Divine Office.org”. It is based out of Italy, and defaults to Italian but offers a variety of language options, including both Latin and the official (Grail Psalter) English translations. It is a relatively simple website but is oriented towards tablets. eBreviary offers everything in PDF format but only offers certain parts for free on its website or App and otherwise requires a subscription because of the copyrights. More and more, with all these apps available, priests, deacons and religious are finding their confreres praying along in chapel with their phones, tablets and eReaders.